* Total number of reviews and star-ratings are based on data collected during the time period Alan's Plumbing Service, LLC has been using the ReviewBuzz system and may not directly match the data found on each public review site. Alan's Plumbing and Heating was FANTASTIC such a pleasant man to deal with! 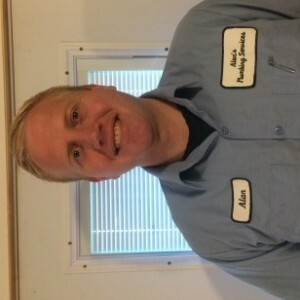 Great Service and excellent attitude he will be my go to plumber from this day forward. When Alan walked up to my door with shoe covers in hand, I knew we had made a good choice. I figured anyone who showed that much care about keeping my house clean would probably show equal care in fixing our plumbing issue. I was right! Thank you Alan for caring about more than just fixing the plumbing problem. Service was prompt and pretty painless. I found them to be very fair and knowledgeable, and Alan was extremely friendly and conscientious too. I would call them again. Alan Twilley provided masterful knowledge and competency when dealing with my old cast iron and galvanized pipes. He created a modern solution to my bathroom's plumbing while also creating a PVC connection point to the main sewer line to sustain the rest of the house's existing plumbing. Will use his service in the future! This is a very acommodating business. I called Alan in the morning and he was at our house by lunchtime. His work is great. While with us, we discussed another problem and he made time to address that problelm the same day. Alan is professional, respectful and thorough. Will use him for our next plumbing need. Alan has done three separate plumbing projects at out home. And for each project Alan was professional, respectful, courteous and friendly. And his work on each project was thorough, timely and well done. Alan is now our plumber! I would recommend him for any job, large or small. Thanks Alan!!! Allan is great to work with. He is knowledgeable, polite, and quick to respond. Alan is great to work with. He is knowledgeable, polite, and quick to respond. Customer service is always a top priority at Alan's Plumbing Service, LLC. Our BBB Membership rating is like a badge of honor as we continuously strive to provide the best experience for our clients.